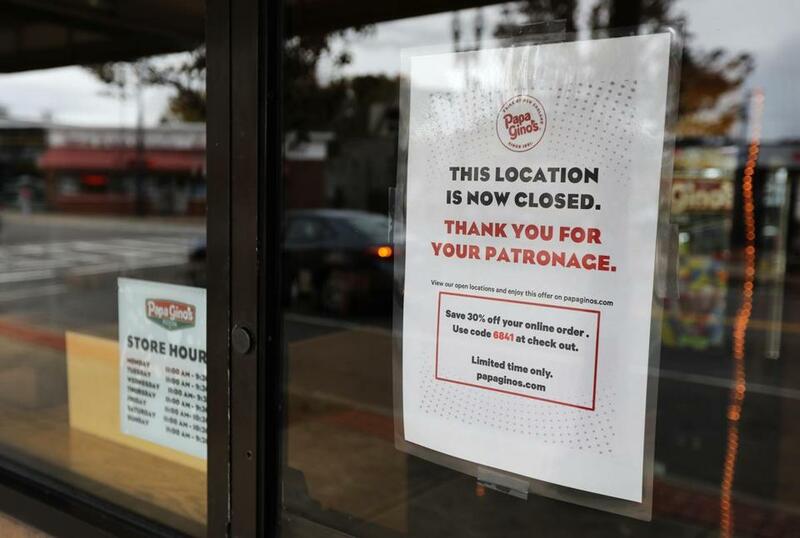 The Papa Gino&apos;s at Hancock and Beale streets in Quincy is among those that closed. Could Papa Gino’s be the tip of the iceberg lettuce when it comes to the state’s new minimum-wage rules? 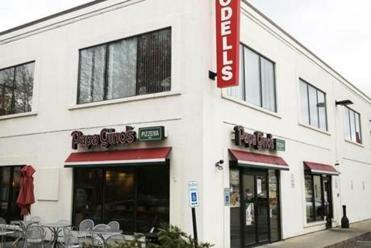 The pizza chain’s parent company in Dedham filed for Chapter 11 bankruptcy today after suddenly closing 47 Papa Gino’s pizzerias and 45 D’Angelo sandwich shops, terminating some 1,100 employees in the process. Chief financial officer Corey Wendland pointed to one big reason for his company’s need for more dough: minimum-wage increases across many of its markets, combined with higher health insurance expenses. Of course, the increases aren’t over yet in Massachusetts. As part of a “grand bargain” settlement between business and labor interests, state lawmakers approved another big hike in June that will drive the minimum up to $15 an hour, over the course of five years, starting in January. The Retailers Association of Massachusetts won an important concession in those negotiations: a phase-out of the time-and-a-half pay requirement for Sundays and holidays. But that hasn’t stopped members of the trade group from grumbling about the minimum-wage increases. Retailers Association president Jon Hurst says the impact goes beyond just the wage hikes: Unemployment insurance costs, workers comp, and a new fee to help cover the state’s Medicaid costs are all influenced, to some extent, by wage rates. Businesses with a large number of lower-paid, part-time workers — such as Papa Gino’s — are particularly affected. According to the statement, Papa Gino’s parent company has reached an “agreement in principle” to sell the chain. Chris Carlozzi of the National Federation of Independent Business says he expects more closures as the Mass. minimum climbs. He says small businesses will deal in other ways — paring back hours or hiring plans, for example. Of course, wage and insurance costs weren’t the only problem at Papa Gino’s. The company’s private-equity owner, Bunker Hill Capital, had taken on tens of millions of dollars in debt. Wynnchurch Capital acquired most of that debt, and is the leading contender to take over ownership of Papa Gino’s, post-bankruptcy. Papa Gino’s also faced increased competition from national pizza and sandwich chains, and found itself saddled with a footprint that was too large — both in terms of sheer numbers and the size of its locations — as more consumers chose delivery and take-out orders over eating in restaurants. Harris Gruman, executive director for the Service Employees International Union’s Massachusetts council, says Papa Gino’s is just making the wage increase a scapegoat for management or strategic errors. Plenty of fast-food chains are doing well in Massachusetts, he says, and many pizza shops are already paying as much as $15 an hour. But small-business advocates would say doing well isn’t going to get any easier for Papa Gino’s or others in the retail and restaurant sectors, not with more wage hikes on the way.